Tessa Longbons | August 6, 2018. Idaho’s abortion report for 2016 shows that total abortions and the abortion rate are slightly up in the state. The Idaho Department of Health and Welfare’s annually published report is approximately 25 pages long. The report was released on the health department’s website in December 2017. In 2016, there were 1,289 abortions reported in Idaho (Fig. 1). Idaho has reported abortion statistics since 1977, although 1994 is the earliest year with data available online. Since 1994, total abortions in the state have increased by 23 percent. From 2015, when 1,272 abortions were performed in Idaho, total abortions rose by a little over one percent. Over the same period, chemical abortions have been increasing at an even greater rate – in 2016, 581 chemical abortions were performed, an increase of almost four percent from the 561 chemical abortions performed in 2015. Since 2001, the first full year after the Food and Drug Administration approved the use of Mifeprex as an abortion drug, chemical abortions have risen by 8,200 percent. Chemical abortions made up 45 percent of the total number of abortions performed in Idaho in 2016. 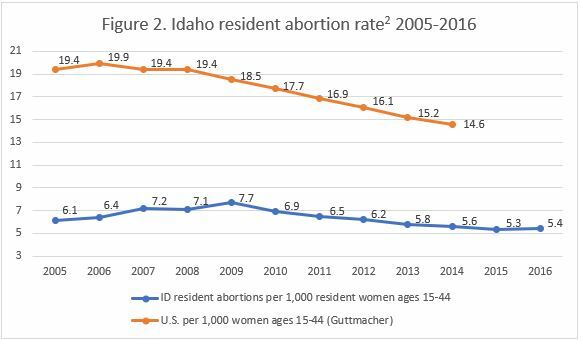 Over the past year, Idaho’s state abortion rate went up very slightly to be 5.4 abortions per 1,000 resident women of childbearing years (Fig. 2). Of the 1,289 abortions reported in Idaho in 2016, 97 percent were performed on Idaho residents. An additional 505 Idahoans obtained abortions in other states, with 66 percent of out-of-state abortions being performed in Washington. These 505 abortions are not included in the 1,289 abortions occurring in Idaho. The vast majority of women seeking abortion in Idaho were between the ages of 15 and 44—three girls were under the age of 15, with another three women older than 44. Thirteen percent were 19 or younger, 59 percent were in their twenties, and 24 percent were in their thirties. Only three percent were age 40 or older. Of the 764 women in their twenties, 57 percent were ages 20 to 24. Over 1,000 of the women seeking abortion in Idaho were white, representing the largest racial category at 82 percent. In comparison, 26 women, two percent, were black. According to U.S. Census Bureau estimates, black women made up just 1.3 percent of all Idaho women ages 15 to 44 in 2016. Race was not indicated for 65 women. Three-quarters of women were unmarried and 18 percent were married, although marital status was not stated in 96 cases. Many women had never experienced pregnancy before, with 72 percent reporting no previous abortions and 49 percent reporting no previous live births. Twenty percent had undergone one prior abortion, and 22 percent had experienced one live birth. However, only eight percent of women had had two or more previous abortions, while 30 percent had given birth two or more times. Abortions in Idaho occurred early in pregnancy, with sixty-four percent performed before nine weeks. Twenty percent were performed between nine and 10 weeks gestation, while slightly more than eight percent were performed at 11 to 12 weeks and another eight percent at 13 to 15 weeks. Two abortions were performed in Idaho after 15 weeks. One of these occurred sometime between 16 and 20 weeks gestation, and the other was performed at 25 weeks gestation or later. In one case, gestational age was not reported. In 2016, nine abortions were known to have caused complications1. 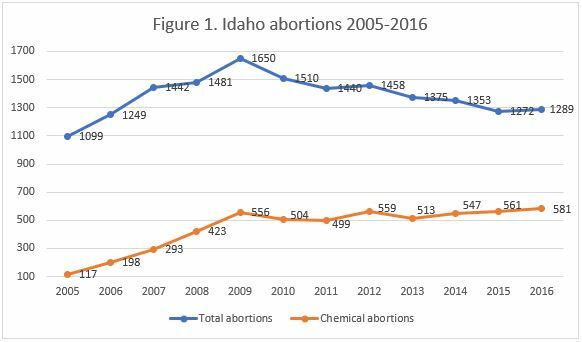 Five of the nine – more than half – were chemical abortions, even though chemical abortions made up only 45 percent of all abortions performed in Idaho. The most common complication was retained products, or pieces of the baby or placenta left behind in the mother’s uterus, occurring five times. One uterine perforation was reported, while three complications were not specified. Idaho law requires that women provide informed consent before undergoing abortions. In 2016, women received educational materials in 1,285 cases. During one abortion, the woman did not receive informed consent materials, and in three cases the doctors did not report whether the educational materials were provided. Idaho’s abortion report does not clarify why education materials were not provided, but it does state that in emergency cases, educational materials might not be provided to women or noted on the reporting forms. Idaho also requires parental consent before minor girls may obtain abortions. Forty-three minors underwent abortions in 2016. In 41 cases, the girls’ parents gave consent. In two cases, the girls were enabled by court orders to provide consent for themselves. In 2011, the Idaho legislature passed a law prohibiting abortions after 20 weeks post-fertilization (22 weeks gestation). However, in 2015, the law was overturned by a federal appeals court as unconstitutional. Still, very few late-term abortions are performed in Idaho. According to state law, an abortion after 13 weeks post-fertilization, or 15 weeks gestation, must be performed in a hospital, and Idaho’s abortion data suggest that some residents seek later-term abortions out of state. In 2016, only two abortions after 15 weeks gestation were performed in Idaho. By contrast, 44 abortions after 15 weeks gestation were performed on state residents; most of these must have been performed on the 505 Idaho women who sought abortion in another state. In 2016, the Charlotte Lozier Institute conducted a study on state abortion reports and ranked the 50 states, the District of Columbia, and New York City on the comprehensiveness and timeliness of their reporting. Idaho tied for 17th best. Idaho has made improvements to its reporting since then, making its full abortion reports available online. Still, Idaho could enhance its public reporting by including information on the level of education and previous miscarriages of women who choose abortion, information it already collects but does not report. Additionally, Idaho could collect and report data related to the facilities where abortions take place, women’s reasons for abortion, and how abortions are funded. Idaho is one of only three states to report the types of procedures that cause complications, but it could strengthen its complication reporting by adding data on complications identified after a woman has left the abortion clinic. Idaho’s resident abortion rate includes abortions performed on Idaho residents in other states.